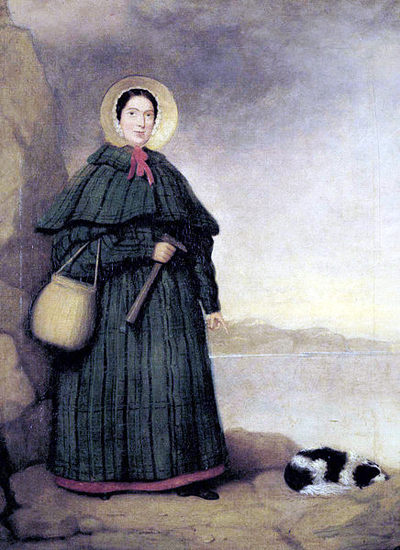 Mary Anning was born on May 21st 1799 and died March 8th 1847. Her life was one of extreme hardship. She was thought to be a curiosity among folk in her time where she lived in Lyme Regis,Dorset.This was because of her hobby of collecting fossils which was unusual for a woman’. Mary Anning struggled to gain recognition for her work since only the upper class London men and scholors received the bulk of the credit for geological discoveries. Anning had followed her father who was also a collector of fossils but had died at and early age leaving the family destitute.This meant that the family had to rely on any form of charity available in order to survive,but Mary Anning was so absorbed in collecting her fossils and was determined to discover what she hoped to be the first importent fossil ever to be found,which she eventualy did. Anning walked many miles over and under unstable rocks,she climbed cliffs at low tide looking for specimens. When Mary and her family met a Lietenant Colonel Thomas Birch a well- to- do fossil collector he was so taken with Annings passion and determination for her subject that he offered to support Mary and her family,he also arranged to sell his personel collection of fossils for the families benefit. Mary Anning became so familier with her fossils that she could even tell from bones discovered what tribe they belonged to and by constant studying had gained so much knowledge she was able to write and talk with eminent professors and most other clever men on the subject who readily acknowledged her understanding of the science. During the last decade of Mary Anniugs life she gained the respect of many scientists and was named the first Honorary Member of the new Dorset Association County Museum one year before her death from cancer. Anning is credited with finding the first specimen of Ichthyosaurus acknowledged by the Geological Society in London. She also discovered the first nearly complete example of the Plesiosaurus,the British Pterodactylus macronyx, a fossil flying reptile. So she acheived her ambition The first lady to find an importent fossil. What a woman.